If you are about to start selling products online you should consider WooCommerce as your platform. It’s really easy to set up. I’ve found 17 amazing online stores to share with you in this post. They feature all sorts of things from boxers through dog toys to handmade leather wallets. The online stores in my collection are from all over the world, including USA, Slovakia, and Spain. 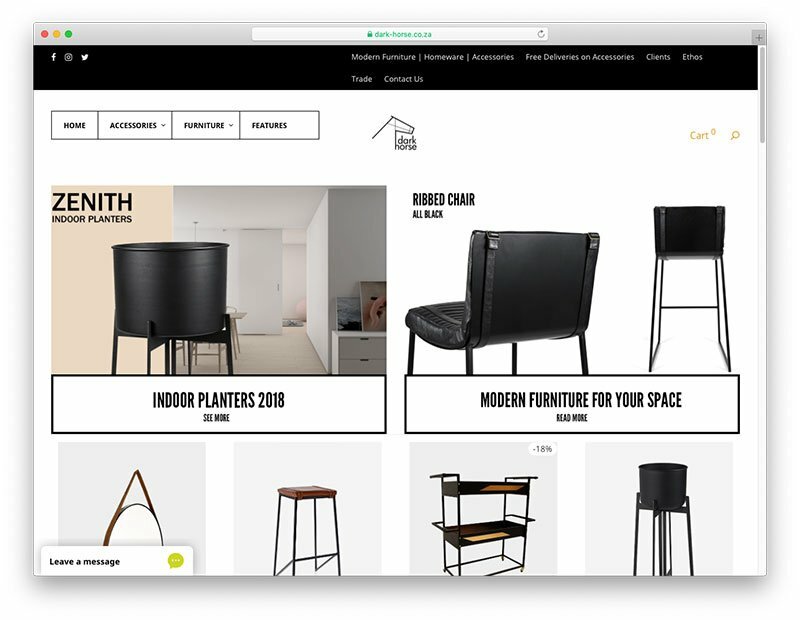 There is plenty of inspiration here for you to start an amazing eCommerce store with WooCommerce. Let’s get started exploring these 17 amazing sites right away! Porter and York is a meat delivery service to your door. It has been featured in the Oprah Magazine. The company prides itself on selling high-quality meat. If I cooked more often I’d definitely take advantage of their services. 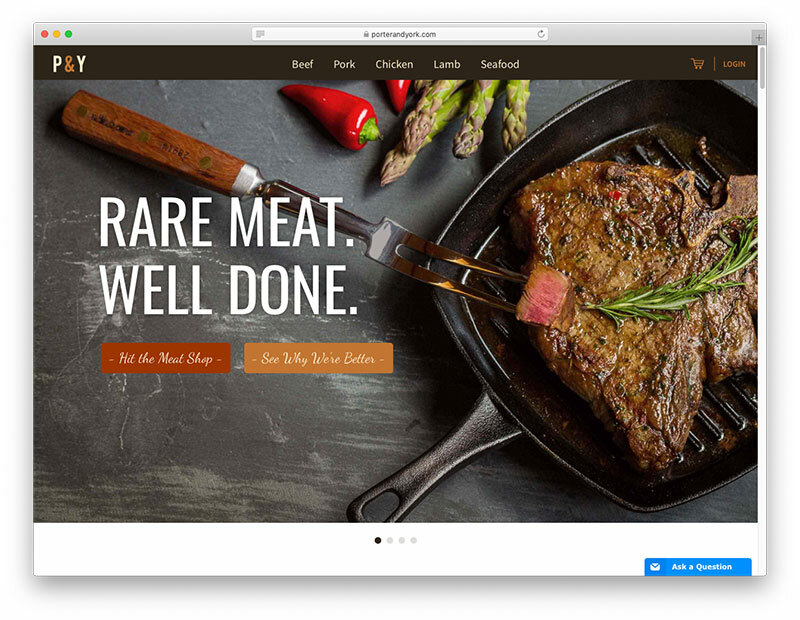 My favorite part of the website is the clean imagery, depicting the meat they sell. The fact you can tailor your order’s cut is so fantastic. It makes me wish I cooked more, in all honesty. 02. Jack Rudy Cocktail Co.
Jack Rudy Cocktail is seriously well-branded! Their bottle designs are amazing! You can get a sense of craftsmanship from banding design, too. After all, the company is family-owned. A well-designed package, in this case, a bottle and the belonging label, can really go a long way. This is true for both in-store and online purchasing. 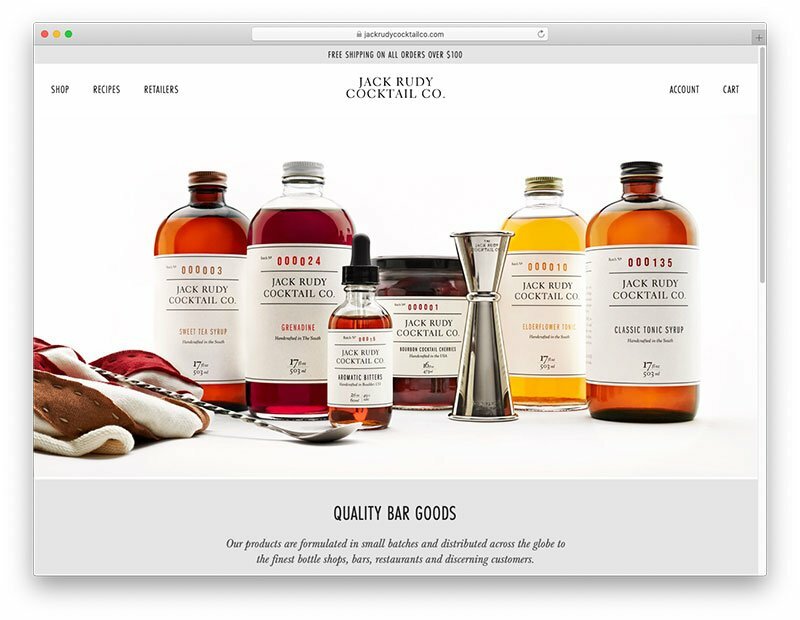 The branding of Jack Rudy Cocktail is fantastic and a great starting point to make people interested in purchasing the product. Dark Horse is a company that makes beautiful natural leather products. They make small things such as wallets and travel bags. However, they also build big furniture pieces such as armchairs. Some of their pieces are spectacular. I love the big photos that greet you on the homepage. The rest of their site could use a bit of improvement. I don’t think it represents the high quality of their products, but I digress. Earthbound sells products for your pets, mostly dogs. They sell all sorts of cute things for your four-legged pets from beds through coats to toys. All of the products look high quality. Making good products for pets takes some serious love. I have a dog myself and I’d pour all my soul into making something great for them. So, I know how people at Earthbound feel. Here we have another cup retailer. This time, though, Joco is selling glass cups made with coffee lovers in mind. The cups are crafted to make the perfect cup of brew. As they are made of glass it might be hard to hold them if you prefer your coffee hot. So, they also come with fun rubber sleeves. You can also buy a cup cover if you want to take your perfect cup of coffee on the go. 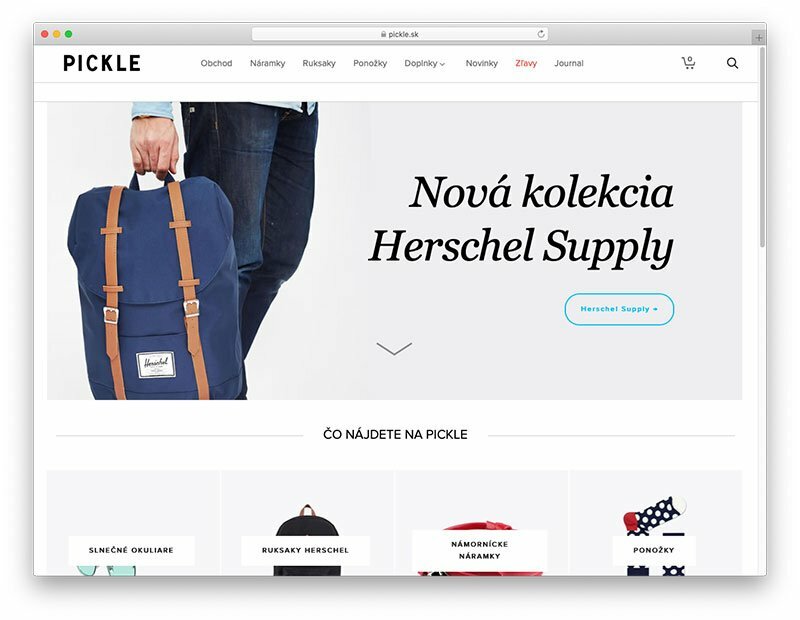 Pickle is a Slovakian company selling accessories. 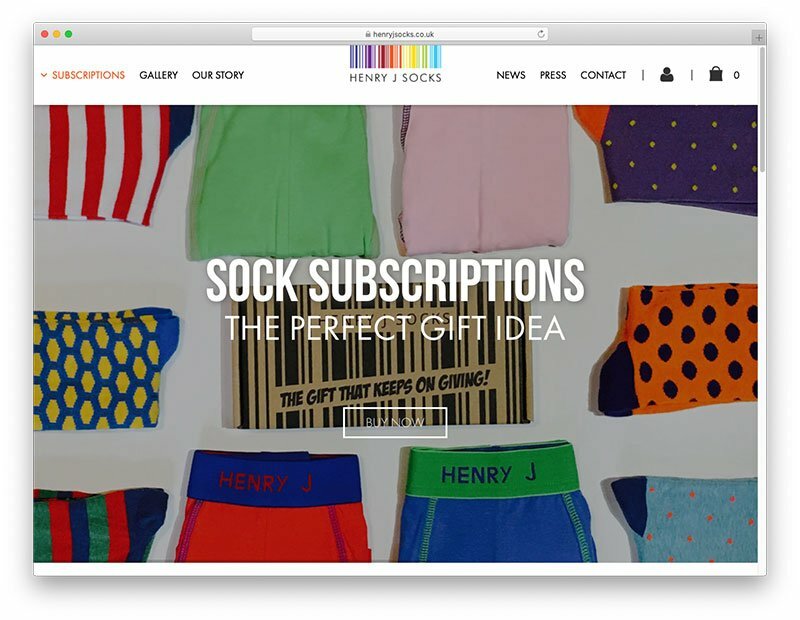 Their products range from backpacks to fun socks. I’ve looked through those socks and some of them are really great and colorful. It was hard for me not to buy something from Pickle. Their selection of sunglasses was great, too. Their products seem to have a great vibe to them which makes the brand of the whole company awesome as well. What else could a designer ask for?! Mini Learners sells children posters. All of their posters are beyond adorable. I would put a few of them in my own house, actually. Although a lot of them are black and white, some of my favorites are the colorful ones. Their use of color is fantastic and well-done. It doesn’t look like the typical plastic yellow, red and blue used for a lot of cheap products for children. I appreciate and respect them trying to do something different. Here we have another men’s shop. This one is selling novelty socks and boxers. I love this store. Again, I wish I could shop here for myself. The socks and boxers are so fun. The different patterns and colors are amazing! I wish more men wore these products. I feel like I haven’t seen too many socks or boxers like these in stores. The products here definitely are dictating the vibe of the website. And, most importantly, it works very well. 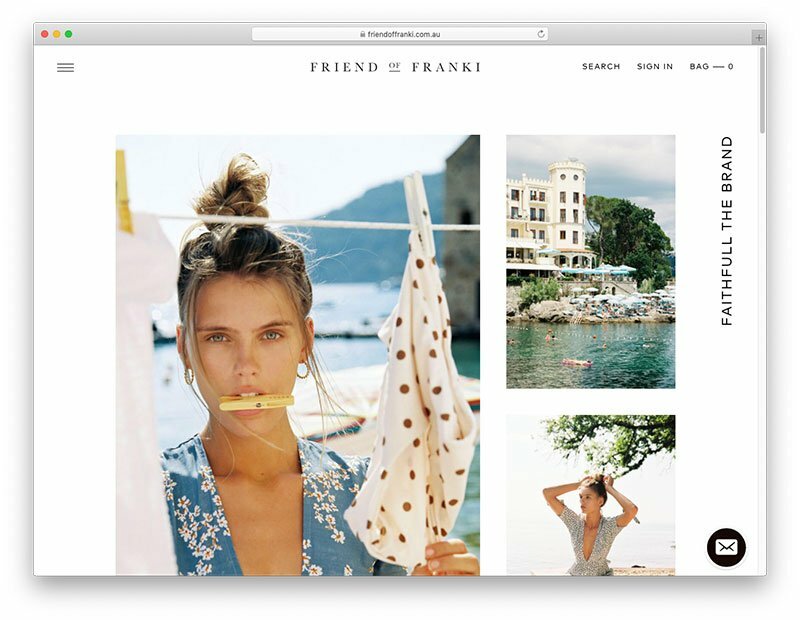 Friend of Franki is an Australian clothing store run by two thirty-something-year-old sisters who dreamt of a life filled with creativity, passion and purpose, and went on to create a beautiful and whimsical brand. 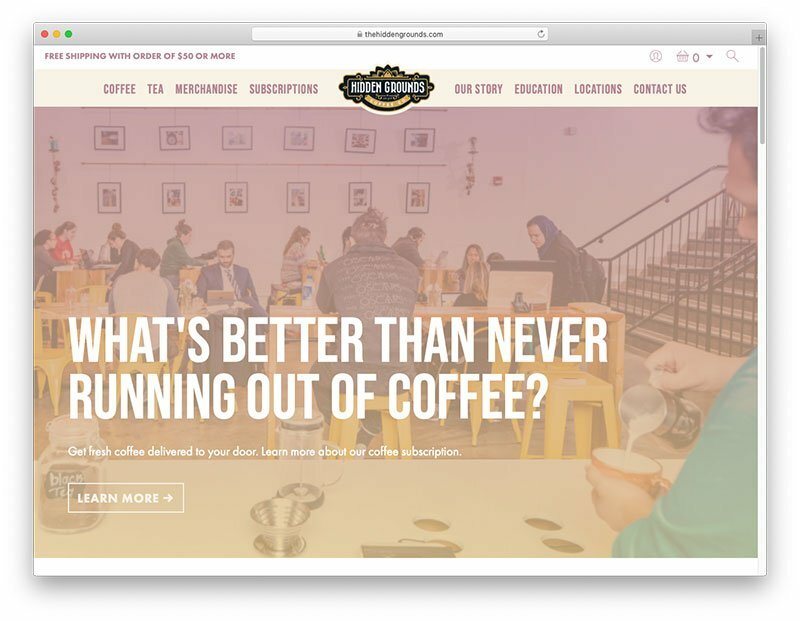 The site is so highly customized you wouldn’t recognize it as WooCommerce at first glance. The images are reminiscent of European summer holidays and spending time with friends. Just scrolling through the images makes me want to buy a dress and book a flight overseas! It takes a couple of seconds to load, but once the video starts playing in the header of this stunning Swedish site it’s hard not to sit and watch it play all the way through. 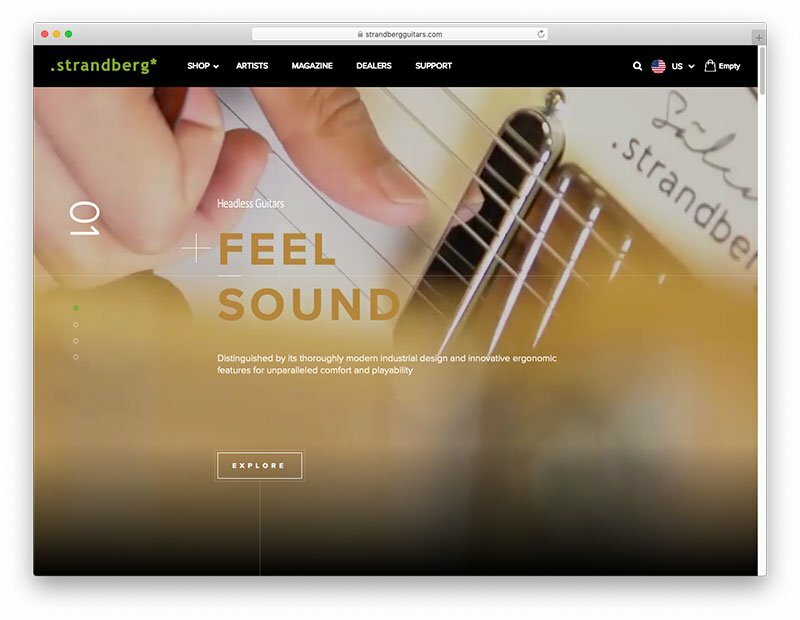 The Strandberg Guitars site is visually striking just like the guitars it sells. The site is a revamp developed by the WooExperts at Angry Birds. It offers a solid customer experience, with a streamlined product gallery that sorts guitars by type and product line. 11. Hidden Grounds Coffee Co.
Just looking at this site makes me want to brew a fresh cup of coffee. Lucky for me, I bought some freshly ground beans today, otherwise I’d order some of Hidden Grounds’ products. There are lots of great photos throughout the site that show off the cool cafes that fall under the Hidden Grounds brand. I really like how you can subscribe to have coffee delivered on a regular basis. I assume they’re using the WooCommerce Subscriptions plugin to help power this functionality. Who doesn’t like a freshly cut bunch of flowers? Well, there are probably people who are allergic to flowers and can’t stand them, but I for one love the smell of flowers. This simple site features loads of beautiful photos, along with easy navigation so you can find exactly what you’re looking for. 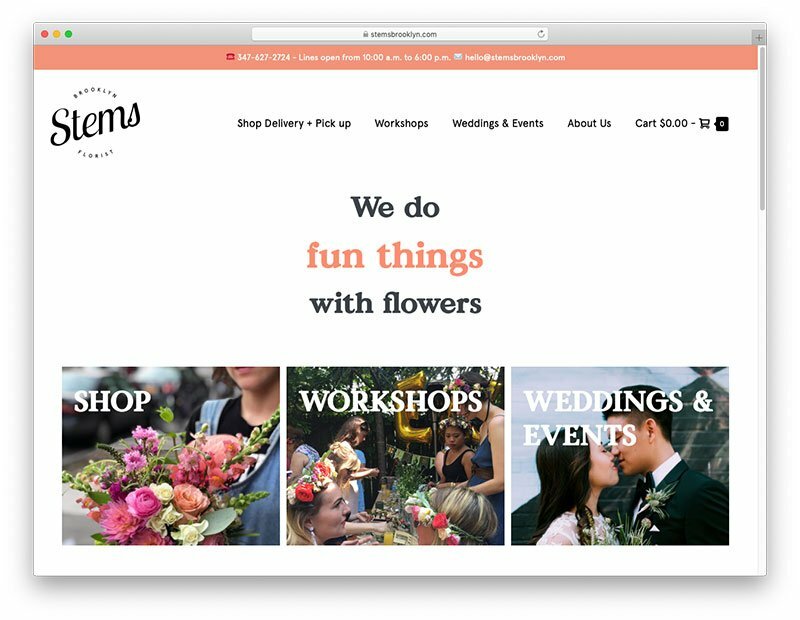 What I particularly like about this site is how easy it is to check out, but also the sweet images of the employees wearing flowers in their hair. 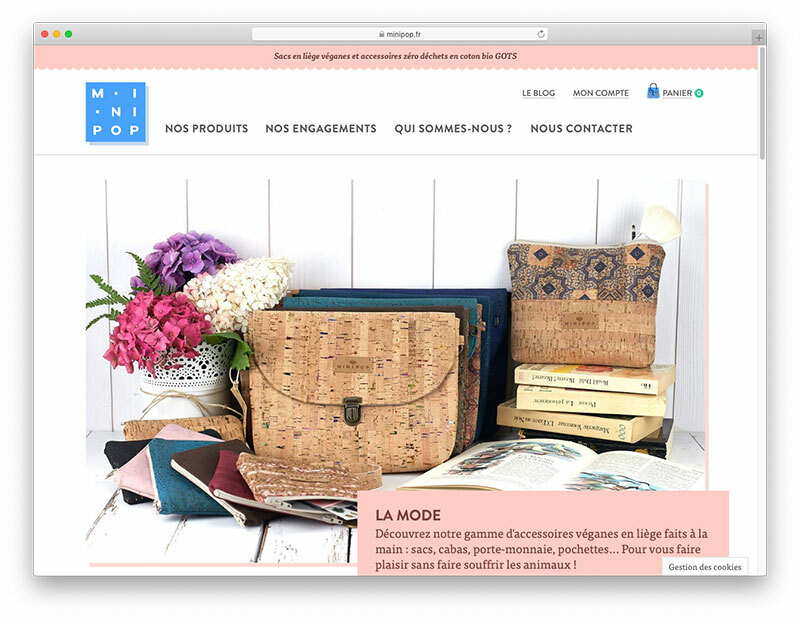 This cute site sells vegan bags and zero-waste accessories that are hand-made in Brittany, France. 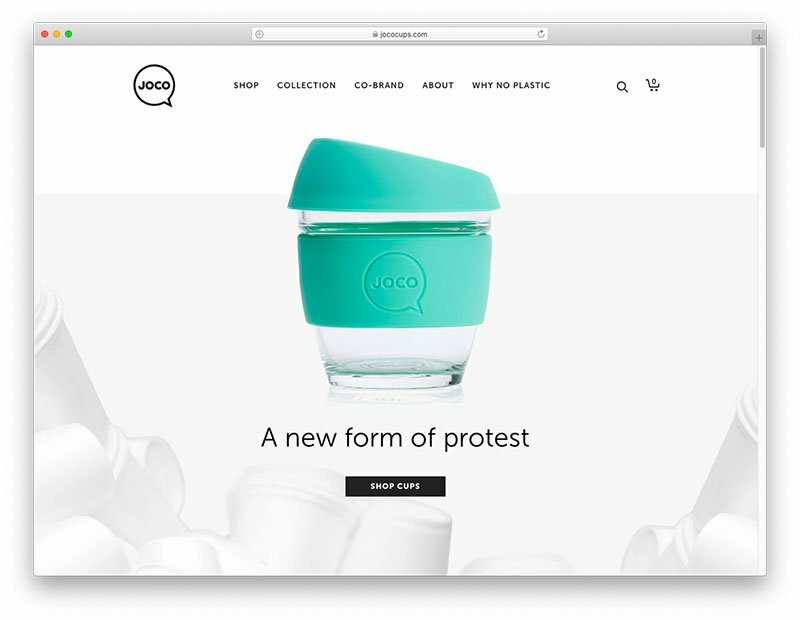 As more and more people around the world try to reduce their waste by abandoning single-use plastic bags, straws, and other disposable products, sites like Minipop make it easier to find sustainable alternatives. Some of the products for sale on this site include vegan bags that are made by hand with cork and fennel, and eco-friendly wipes from natural materials, such as flax and organic cotton. 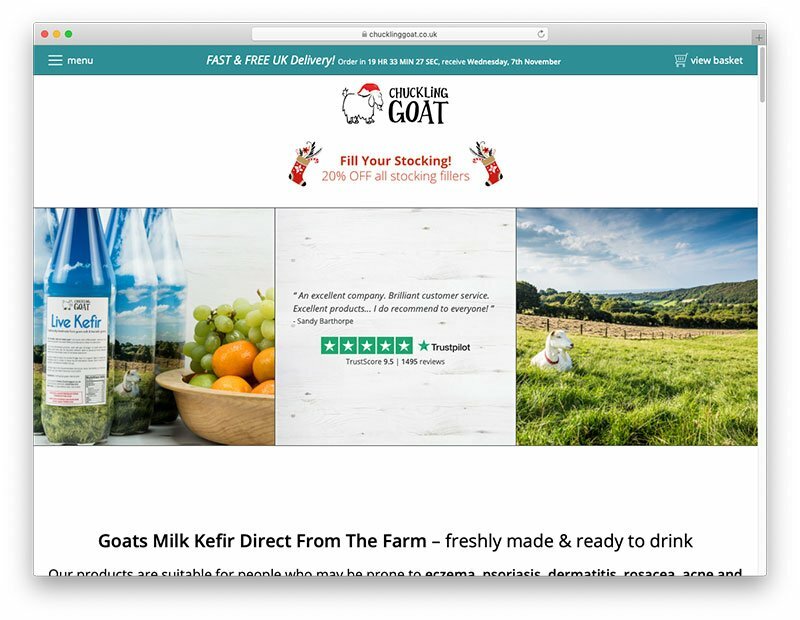 Chucking Goat sells a powerful probiotic drink called kefir. All products sold on the site are handmade on a family goat farm in Wales, UK, and are suitable for people with eczema, psoriasis, dermatitis, rosacea, acne, and allergies. The company’s goal is to leave things better than they found them, which I tend to think is rather admirable. They use natural farming methods and have a commitment to happy goats and using only natural ingredients. The site offers subscriptions as well as one-off purchases. Nordic Ware is a well-known American manufacturer of cooking products, and this is the site for their Australian distributor. It sells a select range focused on their Bundt pans and bakeware, alongside a growing range of delicious recipes. 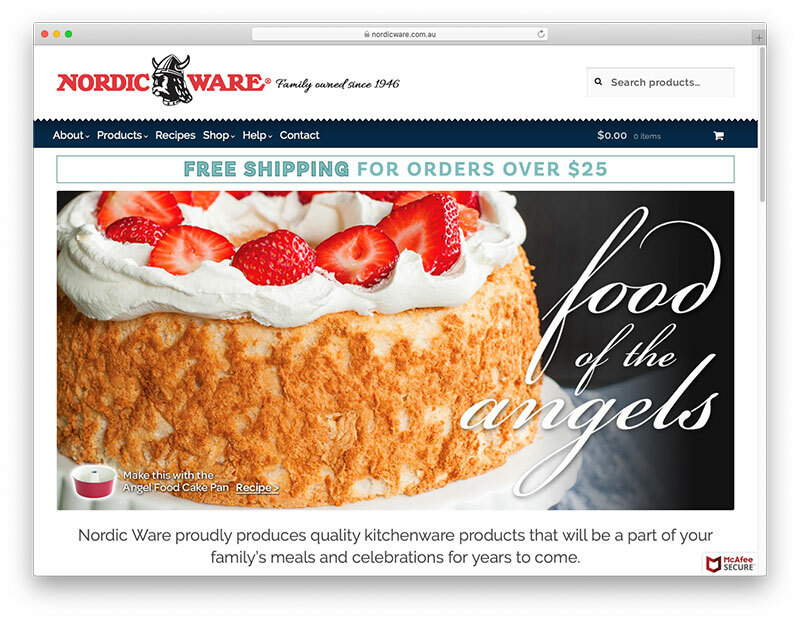 What I like about this site is that it doesn’t feel “corporate.” The Nordic brand has been around since 1946, but browsing the site feels warm and friendly, just like baking a cake with one of their pans. 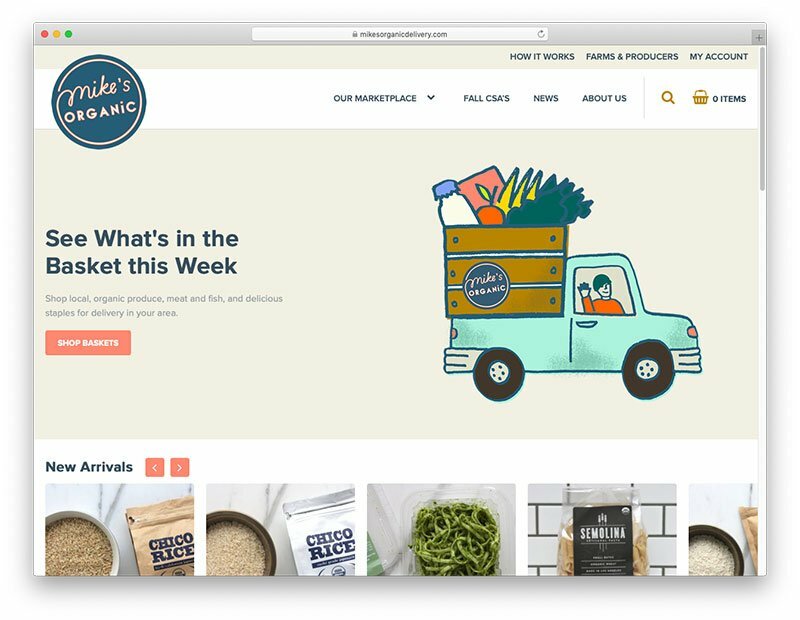 Mike’s Organics is an organic food delivery service based in the U.S. that offers sustainable, delicious food to your door each week. The simple illustrations that pepper the site are paired with photos of colorful vegetables and meats. The site was recently revamped with the primary goal of making the mobile user experience clean, simple and fast. I can confirm they’ve achieved all three—browsing the site is a delight, making it really easy to subscribe for weekly deliveries. What happy when you combine a premium stroller and a rugged wagon? 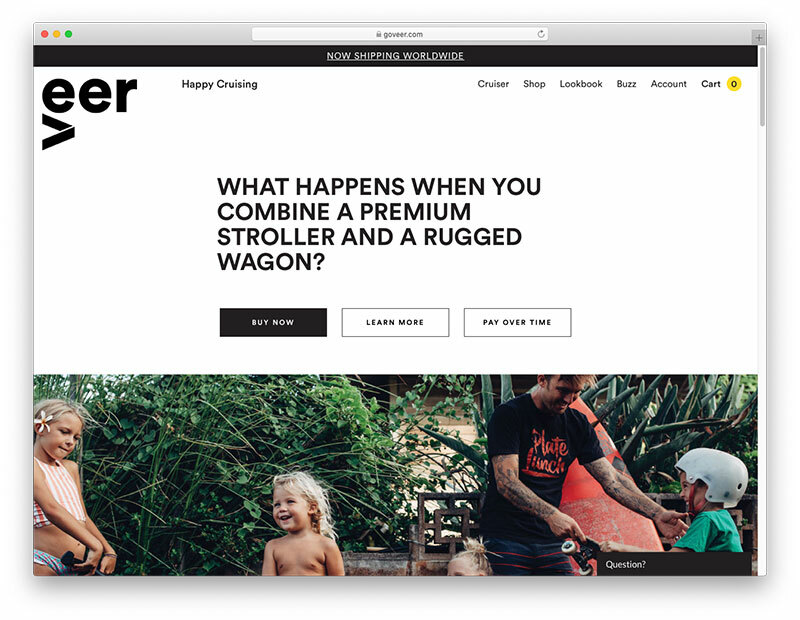 You get the Veer Cruiser, which blends the feel, functionality and safety of a modern, high-end stroller with the fun of a wagon. I love how this product has been designed to bring families together and promote outdoor activities. As far as I can tell, it’s the first-ever premium baby stroller and rugged wagon hybrid. It’s an all-terrain vehicle that comes equipped with two cup holders and a handy snack and drink tray. The site features plenty of young families having fun with the cruiser, which further helps to sell the product. 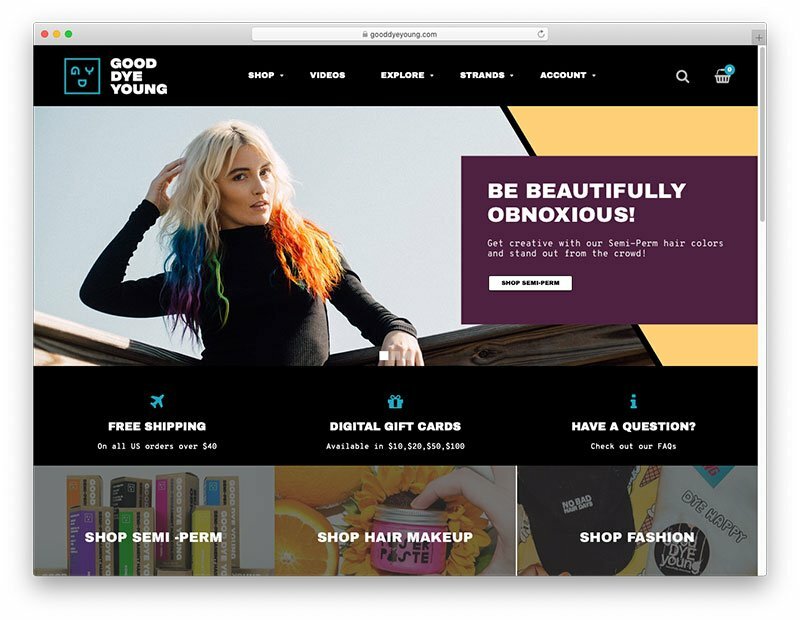 goodDYEyoung is a cruelty-free, vegan hair color brand supporting artistry, creativity, and self-expression. The site is bold and in your face, but like the products, and promotes the brand’s message of self-love through self-expression. The site is super easy to navigate, with loads of color, and animated product banners. The product images, in particular, are fun to scroll through. They give you an idea fo what your hair might look like if you buy the products, which makes me curious about what color might best suit my hair? Maybe bright green or pink? 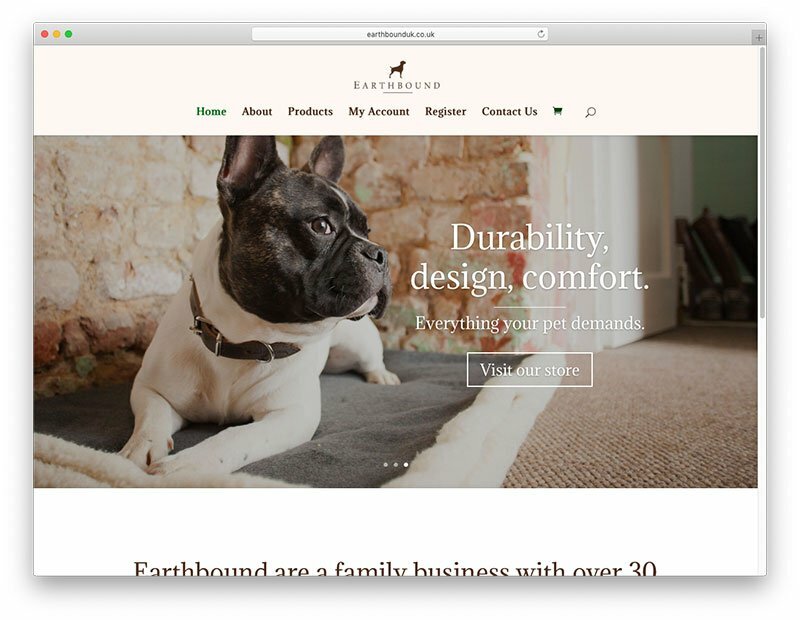 If you’re looking to start your own WooCommerce shop, you may also want to check our post on the best WooCommerce themes. Please check your links again and update. Minileaners site is down. 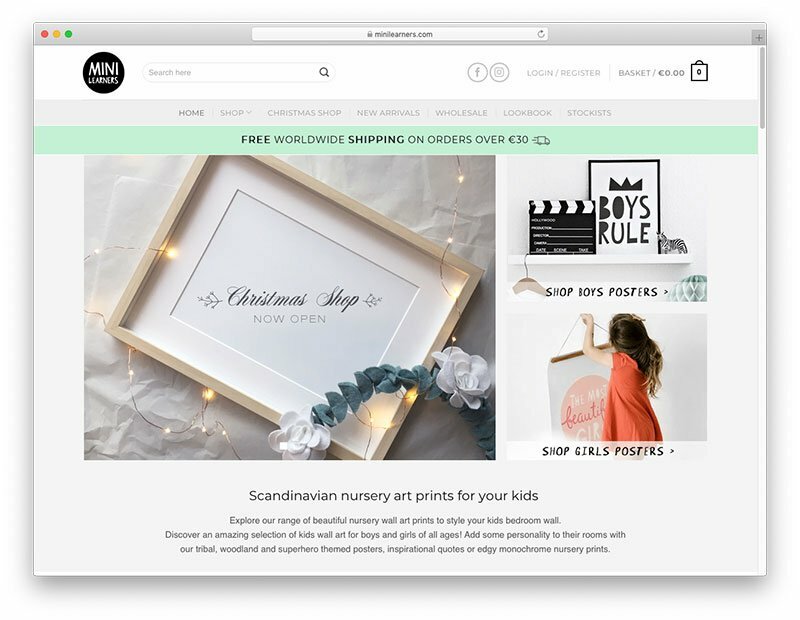 Some of the websites have switched to shopify.